SHANGHAI, July 27 (Xinhua) -- The organizer of the first China International Import Expo (CIIE) on Friday said Jinbao, a scarf-wearing giant panda, is the mascot for the event in Shanghai in November. "Jinbao sounds like 'Jinbo,' the abbreviation of the CIIE in Chinese, and means 'treasure of the CIIE' as well as 'bringing in wealth,' said Vice Minister of Commerce Wang Bingnan at a press conference. "The panda is China's national treasure and name card. Adored by all for its chubby and lovely image, it has become China's envoy for friendship and contributed to China's friendly ties with other countries," Wang said. 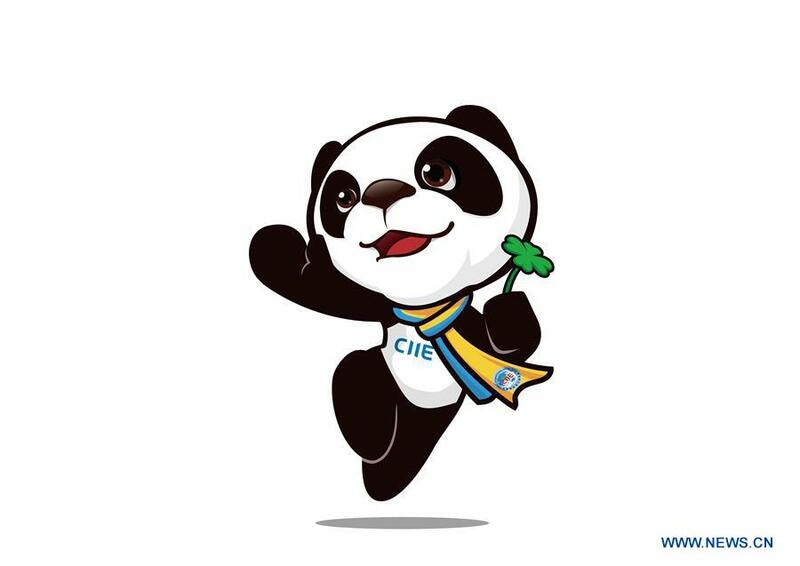 The mascot wears a blue-yellow scarf embroidered with the logo of the CIIE. While the color yellow stands for the Silk Road Economic Belt, blue stands for the 21st Century Maritime Silk Road. A four-leaf clover in the mascot's hand represents the National Exhibition and Convention Center in Shanghai, where the expo is to be held. It is also believed to bring luck to people. The slogan of the CIIE, "New Era, Shared Future," was also unveiled Friday. The expo logo is comprised of the Earth surrounded by a light-blue ring, with the expo's name in Chinese and in English, and the abbreviation CIIE. "The earth in the middle means that the CIIE is inclusive, diverse and has broad coverage, and that it will become an open cooperative platform for countries to demonstrate themselves and trade with each other," Wang said. The green China on the earth embodies the idea of green development, while the surrounding ring in light blue represents solidarity and cooperation with all countries, and China's efforts to support economic globalization, he said. China on Friday announced the 100-day countdown to the opening of the CIIE, which will be held from Nov. 5 to 10.